Technology on-point for banking, finance, insurance. This primer supplies essential background on the growing development of revolutionary new digital products in the world of financial services. Traditional consumer opportunities for banking, lending, and investing are dashing toward an entirely new range of products — all built upon modular technology-powered platforms. Designed for the modern generation of people looking for ease, affordability, inclusivity, mobility, and independence — these products + services are known collectively as fin-tech: an abbreviation for financial technology. A key foundation for these products is web access to the customer’s account from mobile phones, laptops, and tablets — plus automated support from virtual assistants and robotic analysts. The financial services sector has become truly digital. In addition to the fresh new line-up of opportunities for the public, fin-tech is also breaking ground behind-the-scenes. The companies + organizations making-up the framework of banking + investing are using computer software programs to: sort, characterize, organize, and understand trends in vast arrays of financial data. Software techniques from the computing field of artificial intelligence are used by analysts to: assess the market, speed transaction times, rapidly perform complex math, and process data in massively parallel ways. This is an unprecedented use of computing to help financial experts: decide on the best investment opportunities, manage customer portfolios, improve the functionality + efficiency of mobile financial apps, target best-fit customers, plan for the economic climate, and route enormous volumes of data into packets so they can visualize patterns. Business solutions fin-tech products can manage extensive payment systems for merchant networks. Insurance products are also touched by fin-tech — this range of updated offerings is called insure-tech. So both the front-end + back-end of financial services is experiencing innovation. Professionals in the field say many markets are affected by fin-tech: retail, enterprise computing, mobile. This is accompanied by accelerating investment from traditional banks + service companies into start-ups. Incumbent businesses are rushing to keep-up with the times — by partnering with fin-tech projects or launching new products of their own that appeal to fin-tech customers. A featurette on high-tech for finance — with insights from: firms, partners, businesses. Global finance thrives with deep data. Groups must adopt the state-of-the-art in computer analysis for asset management + fund opportunities to succeed in the 21st century. AI is transforming business at a level we haven’t seen since the Industrial Revolution — such as: sophisticated fraud detection, hyper-customization of services, identifying un-tapped business opportunities. To ride the emerging wave of AI, financial services companies must navigate evolving standards + regulations — and harness risk. what does this mean for the work-force? what is the future of artificial intelligence in the financial services? Jersey Finance is a not-for-profit international financial center. We’re focused on developing a better, more certain future for businesses, for the general public at home + abroad — and for the finance industry as a whole. By working with the right people, and creating a safe + secure environment for investors, we grow both local + international economies. description: by Jersey Finance org. 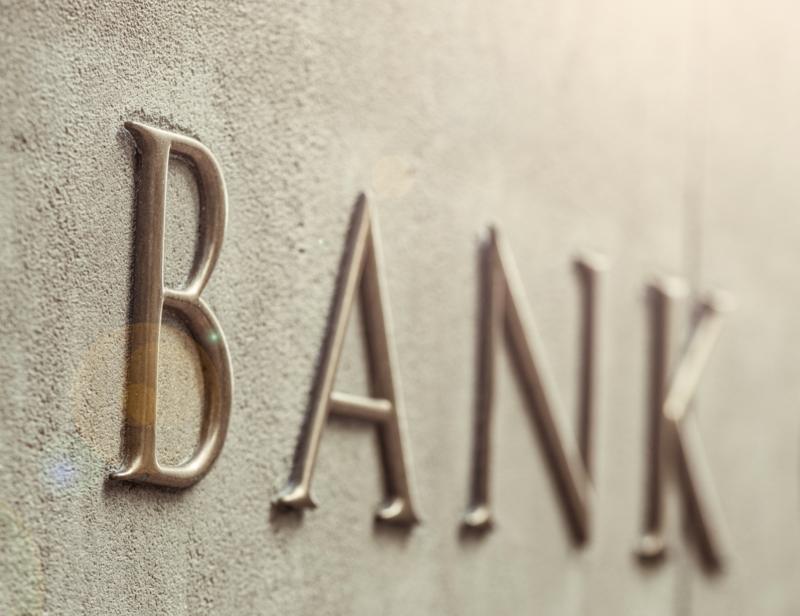 Among the many services they offer, banks are first + foremost money depositories — convenient places to hold and withdraw cash. These days, with all sorts of ways to navigate the digital space: banks and financial institutions are making wealth access easier than ever. From entirely mobile banks and payments between friends — to artificial intelligence enhanced chat-bots and anti-money laundering software. These fin-tech companies and services are bringing banking into the digital age. So venture capitalists are pouring money into start-ups that are offering basic banking services — known as neo-banks or challenger banks. In year 2018, US neo-banks got 4 times the funding they received in year 2017. And 10 times as much funding as they did in year 2015 — according to data from CB Insights co. 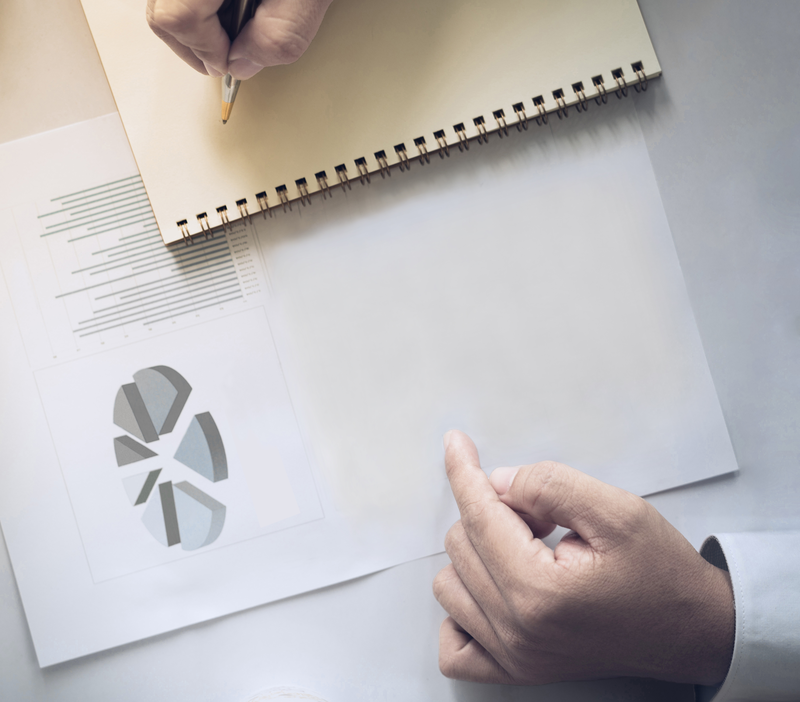 The consulting firm CG42 co. said in a report that it expected the 10 largest banks would lose $159 billion in deposits to smaller competitors over the next year. New financial technology is revolutionizing the insurance industry with innovations collectively called “insure-tech.” Traditional insurance products are transforming to: improve customer experience, simplify policy management, and increase competition — making insurance more vibrant, sustainable, and agile. 20 years ago, it was hard for a new business to find insurance. After meeting with an insurance agent, they might find out the agent’s carrier didn’t have any coverage options to fit their business. Now with insure-tech: anyone can start a consulting business, go on the web, and find out discover in 20 minutes how much their policy will cost. In year 2016 insurers spent nearly $187.3 billion on information technology (enterprise computing + business software) — accounting for approx. 26 % of the whole of financial services spending. Old, out-dated, legacy computer systems slowing innovation. Each year insurance agents spend 1000s of hours supporting customers in the decision making process, providing standard on-demand info or reports. Tech can automate those processes with: virtual chat-bots, reporting tools, mobile technologies, and voice recognition software. A large customer care center can be replaced by chat-bots to reduce costs in customer support + sales. According to Accenture co. in year 2016: artificial intelligence and the internet-of-things (IoT) accounted for half of total investments in insure-tech start-ups globally. The internet-of-things is: the network of devices such as vehicles, smart home appliances that contain electronics, software, actuators, and wired + wireless connectivity — enabling these things to connect, interact, and exchange data. Sensors networked into smart houses + smart facilities give owners + insurers real-time data on the home’s safety — damage prevention saves money for the consumer + insurance provider. 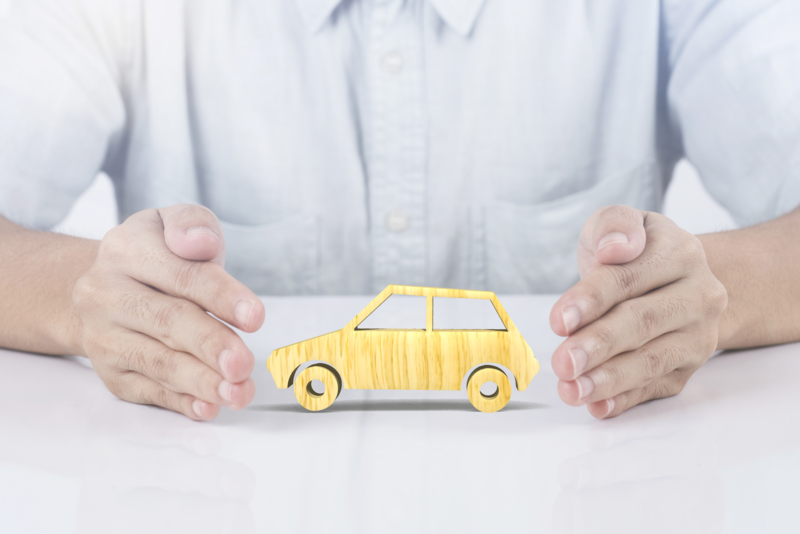 Becoming popular with customers is “telematics insurance” — a group of innovative car insurance offerings based on a safe driving record. A telematics box is installed into a car. The device includes: a global positioning system (GPS), motion sensors, a subscriber identity module (SIM) card, plus analytics software. A telematics box tracks vehicle: speed, location, time, crash accidents, driving distances, breaks, and more driving data. First, the telematic system processes the info it gathers — and transmits it via the mobile internet to the insurance company for further analysis. Then the driving analytics are added to a customer personal account. watch | video: the future of telematics • by GeoTab co.
watch | video: understanding telematics • by OakHurst co.
Insureon | what is insure-tech? Financial Times | video: is telematics the future of car insurance? 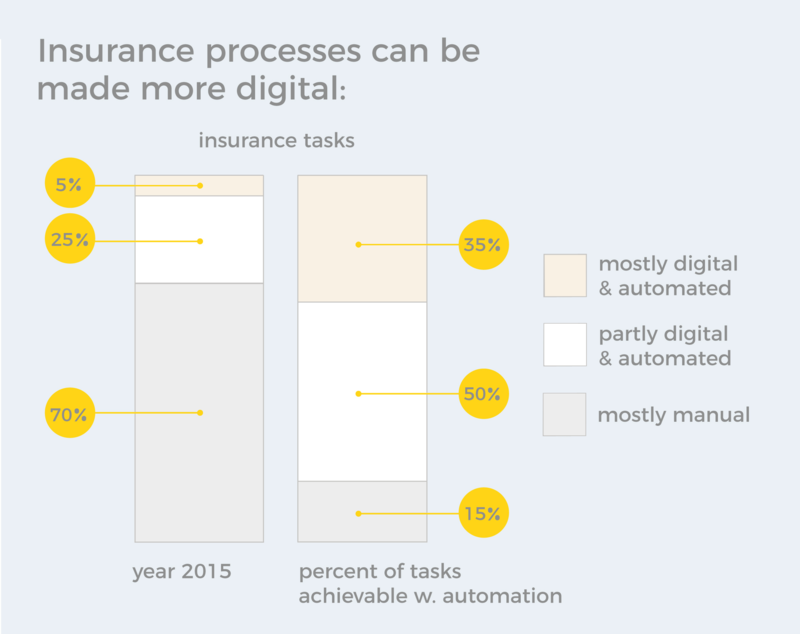 chart title: Insurance processes can + will become more automated by smart software. with data from: McKinsey co.
For fraud detection + security. With neo-banks + challenger banks. With crowd-funding + freelance markets. Insurance for consumers + business. brand: World Economic Forum org. featurette title: what is fin-tech? do you: pay for goods or services with your mobile, transfer money with your smart-phone app? do you: engage the advice of an artificial assistant to manage your money? bio: head of partnerships • for the fin-tech program | 500 Start-Ups co.
how are they going to get the talent to transform? * cNBC = cable National Broadcasting co.
deck: Technology on-point for banking, finance, insurance..